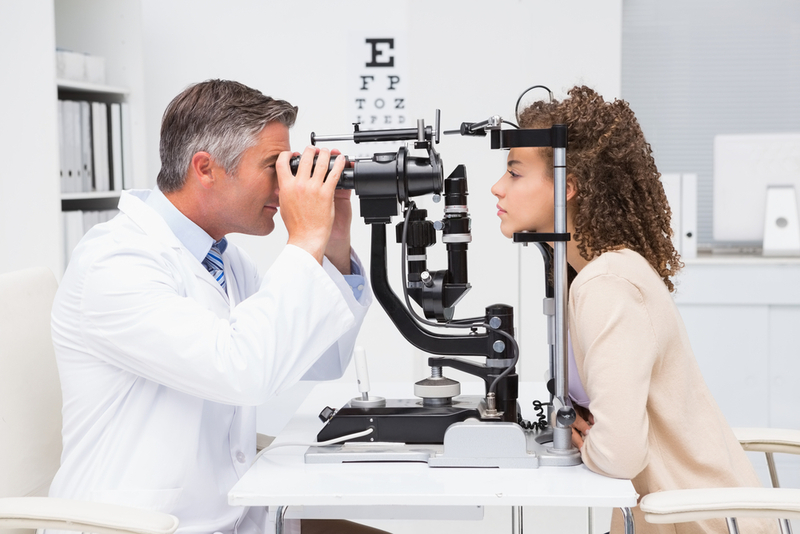 Whether you are looking for a new eye doctor or scheduling an exam for the first time, trying to find the professional that meets your specific needs can be a confusing task. A yearly eye exam can help prevent all kinds of issues from forming with your vision and overall health. First let’s take a look at your options and talk a little bit about the types of eye care professionals available and some common issues that each eye care professional may treat. An Optometrist is the most common eye care professional in the United States. They go through 4 years of optometry school. Optometrists will have an OD after their names. They earn a doctor of optometry degree. Optometrists can do basic eye exams, fit glasses and contact lenses, diagnose most eye issues and prescribe certain medicines. If a serious issue arises an Optometrist will refer to an Ophthalmologist. An Optician ( depending on the state ) can fit you for glasses and contact lenses. And often works under an Optometrist or Ophthalmologist. There are two main types of Opticians. dispensing Optician and prescribing Optician. A dispensing Optician follows the orders of the Optometrist or Ophthalmologist to fill your glasses or contact lens orders. A prescribing Optician ( in some states ) can perform basic eye exams and fit contact lenses and can write a prescription. An Optician does not diagnose and eye health issues. A great way to look at it is the Optician is like your pharmacist or nurse. The Optometrist is like your primary care doctor and the Ophthalmologist is your specialist. Most people will seek out an Optometrist for their basic initial exam and get a solid diagnosis to most eye health issues. Which doctor is best for your eye care needs? Exams and prescriptions. Either optometrists or ophthalmologists may perform eye exams. And can both prescribe glasses or contact lenses. Special contact lens fittings. An optometrist is most often the best option for contact lenses. Optometrists often specialize in difficult or complicated contact lens fittings. An Optometrist can also help order specialty contact lenses that can treat color blindness or migraines with Orion Vision Group’s therapeutic BioMed lenses. Laser and other surgeries. If you are considering laser corrective surgery ( https://en.wikipedia.org/wiki/LASIK ) or needs any other type of eye surgery then you will want to consult with an Ophthalmologist. Serious eye issues. If you have a serious vision issue such as macular degeneration or diabetic retinopathy the you will need the expertise of an Ophthalmologist. And of course in an emergency situation please do not hesitate and call 911 to get immediate attention in an emergency. So now that you are familiar with the types of eye doctors available to you it’s time to actually go and find one. Here is some tips to find the eye care professional that’s right for you. Google is your friend. A simple google search for eye doctors in your area ( for example. Google “Optometrist in 90210” ) will get you a list of eye doctors in your zip code. Now that you have found a few eye doctors look online for reviews from other patients. Were they professional? Did they address the patient’s eye issues effectively? Reviews can be a powerful tool to narrow your search. Healthgrades is an excellent resource to find reviews on qualified eye care professionals in your area. If the equipment the eye doctor uses up to date? Are they utilizing new and modern equipment to diagnose your issues? Do they guarantee their work? You want to make sure your eye care professional will stand by their work. And in rare cases something is off they address it in a timely and professional manner. For more information on how Orion Vision Group works with your eye care professional please feel free to contact us or call us at 1 866-300-6257. Orion Vision Group offers a large selection of custom made lenses that can address many vision issues. Specialty contact lenses such as our therapeutic BioMed lenses can treat a variety of vision problems as well as our BioSport and BioColors line of custom contact lenses.